The KTC Heavy Duty hand rivet squeezers are made of stainless steel to the highest quality standards. Features include an adjustable set holder, locking lever arm, comfort caps and easily interchangeable yokes. The hand rivet squeezers accept rivet sets and dimple die sets with .187 diameter shanks. The adjustable set holder allows the user to accommodate various lengths of rivet sets and rivets. KTC155 AN426 Dimple Die Set 3/32"
KTC156 AN426 Dimple Die Set 1/8"
KTC157 AN426 Dimple Die Set 5/32"
KTC158 AN426 Dimple Die Set 3/16"
This 32 piece kit comes with semi-tubular, oval, AN470 & dimple die sets (male and female) for sizes 3/32,1/8, 5/32 & 3/16. Also has assorted flush sets. All Sets are .187 shank. Custom Foam molded box with 1 ½” hand rivet Squeezer and 3” yoke and quick release pins. The Hand Squeezer has adjustable set holder to easily adapt to multiple riveting applications. Tool is made of Stainless steel and quality craftsmanship. This 45 piece kit comes with semi-tubular, oval, AN470, AN455, AN430, AN442 & dimple die sets (male and female) for sizes 3/32,1/8, 5/32 & 3/16. Also has assorted flush sets. All Sets are .187 shank. Custom Foam molded box with 1 ½” hand rivet Squeezer and 2" & 3” yokes and quick release pins. The Hand Squeezer has adjustable set holder to easily adapt to multiple riveting applications. Tool is made of Stainless steel and quality craftsmanship. 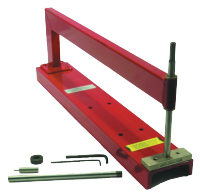 The KTC232 Bench Riveter is made from heavy-duty 1” x 2” steel tube. This allows the riveter to maintain perfect alignment that will insure top quality dimpling and riveting. Machined and jig welded with a powder coat paint finish. 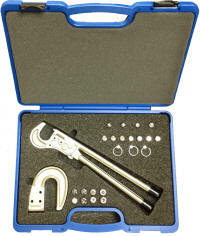 Ideal for riveting small parts, assemblies and spars. Heat treated stainless steel driver shafts (2 included). Includes one with .401" shank for use with a rivet gun and one flat for use with a hammer or mallet. Both accept .187" shank dies and rivet sets.